X-SMALL 29" 24" 36" 15 1/2"
SMALL 36" 26" 38" 16" 36"" 33"
MEDIUM 38" 28" 40" 17" 37" 33"
LARGE 40" 34" 42" 18" 38" 35"
X-LARGE 44" 38" 46" 20" 39" 36"
Set of Blouse, Full Circle Skirt & Culotte. Full Circle Skirt & Blouse on a bias cut. 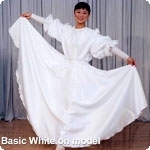 Skirt features elastic side waistbands and band roll. Blouse sleeves are cut on the bias for elegant fall. 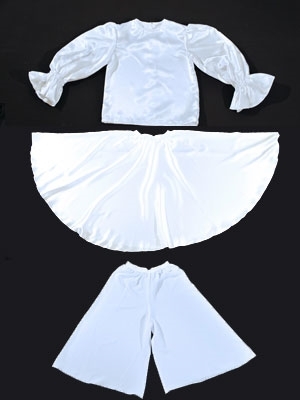 Blouse & Skirt: Satin - 100% Polyester washable. Culotte: Poly Pongee - 100% polyester.